Back in late February/early March, I was exiting a theater by walking up a staircase in the aisle: the kind of steps where the horizontal plane is 6x times as wide as the vertical incline is tall. I was trying to hurry and I extended my step to walk faster up the staircase (one step forward for every step up - like a normal set of stairs), instead of allowing for an extra footstep on each step. Everything was fine . . . until I got home and tried to get out of my car thirty minutes later. I could barely stand. That elongated stepping pulled something in my thigh and my knee and my hip. For the next two weeks I could do nothing physical. I even took to using a cane for a few days. I decided as long as I was sitting in a chair near my daughter, who can crochet, I would watch her intently until I could figure out what all that hook movement is all about. I am not someone who can never learn from the book and as much as my Nana and Mom tried to teach me by their example, I never ever learned squat when it comes to the needle arts. And, in case you have not figured it out by reading me through the years - I do not take or follow directions easily. After a few hours of observation, I started playing with some yarn and a hook. This was followed by a day of making up my own stitches, several of which I have come to learn are real crochet stitches and others are simply stitches discombobulated. After three days of playing with yarn, I decided to make an afghan for a dear, dear friend who is moving away from Florida for the cold and f-f-frosty northern reaches of New Jersey. I only had five weeks before he was leaving and I have never crocheted anything before in my life. Very L--O---N---G story short: my body finally healed by late April. I was sadly out of shape by then and eating food that added to the inflammation. Making it harder to judge my level of healing. I had used the injury to procrastinate myself into stopping all exercise. I could have been doing upper body work but instead, I sat in a chair and when I wasn't working, or eating, or buying food, I crocheted . . . crocheted and crocheted. My thought was "I can't eat if I am crocheting." Guess what? I also cannot exercise while crocheting. either. I am not that coordinated. I on the obsession switch and crocheted. Five weeks of crocheting produced this queen size work of art. My own design. 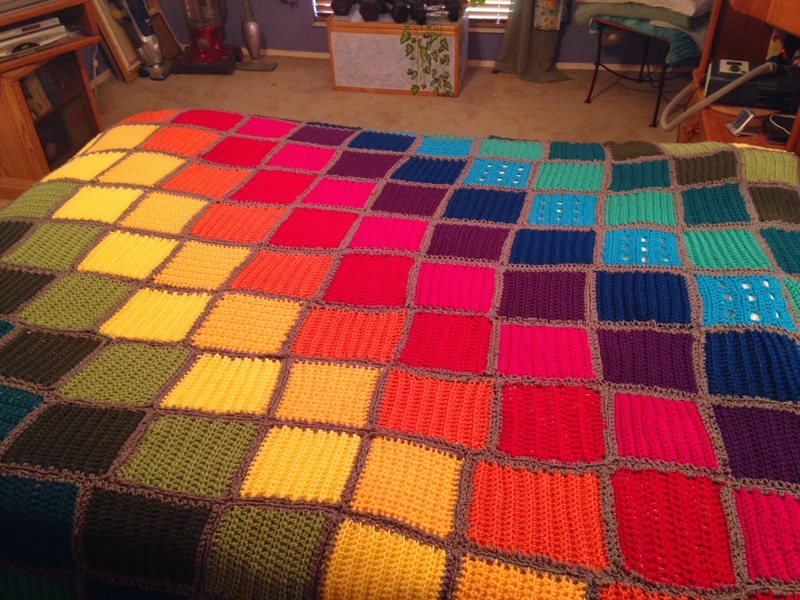 12 rows of 12 colors of the rainbow. The grey binds all the colors together. 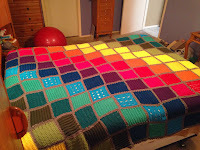 Every other color is a different stitch or pattern of stitches. There is a scalloped border. My daughter Lauren taught me that border stitch). Speaking of Lauren, the next entry will be about her return to New York, or Civilization (as she would call it). Yes, she is recovered, repatriated back to New York City and reestablished as a New York subway rider. (Lauren is awesome!). The trip to NYC is where I got the idea for naming this series of posts Crash and a Slow Burn. You see, once we got to New York, I had a slight car accident . . . . It is super easy to move from one obsession to another for me. Super easy to immerse. I have taken to short immersions. So I work on one small thing, finishing it, come up for air, back to normal life, then work on another short thing. It is a hard thing for me to balance. Because I need things to fill my time. But I get stuck in loops very easily. Did you start buying stashes of yarn? Or just bought what you needed? I have to be careful to just buy what I need for a project. 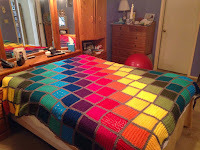 Vickie - I bought some colors and then decided I needed some stages of color (another degree of yellow, green/blue and blue/green) and then the grey, which I bought last. It was an impulsive project all around but I really enjoyed learning and practicing. I have some left over and did buy two more colors near the end because my mind started planning my next project. Then I put that idea aside for now. 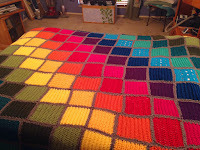 My NEXT plan is to use up any leftover yarn by nearing Granny squares and putting the leftovers together for another afghan. Loops - oh yes. I get stuck in the loops. In my house we call it "Big Ben, Parliment." It is a National Lampoon's European Vacation reference.